The Funky Felter: A Call to Feltmakers & Felt Artists from Lark Books! A Call to Feltmakers & Felt Artists from Lark Books! 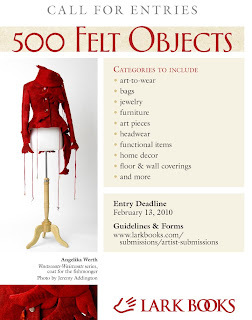 A very nice editor from Lark Books contacted me yesterday about submitting some photos of my felted creations for their upcoming publishing project, 500 Felt Objects. She also asked that I pass along the information to my fellow fiber artists who work with felt. I thought the easiest way to do that would be to post it on my blog. You can find the guidelines here. Now I just have to decide what to submit. If you have any suggestions of what photos of mine I should submit, please do share in the comments or email me. I'd love some help making up my mind! And, Linda, that is really awesome about the giveaway comments. I never thought it would be soooooo many :O) Thank you! Thank you for this info. I'm going to send Lark photos of my latest creation! By the way, I'd like to ask if you can do a stamp with my logo on it. Please pm me at chris @ myfavoritethimble.com (delete the spaces before and after the @ sign.